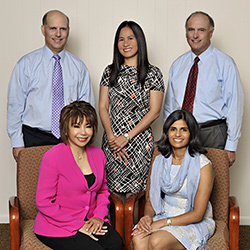 We are a group of five psychiatrists serving the Union, Hudson and Essex County areas out of our offices in Westfield , Hoboken and Upper Montclair, New Jersey. We have all trained at excellent teaching programs and are all board certified. Together we offer a range of training and experiences which address psychiatric issues from childhood through adulthood including problems with depression, anxiety, attention/concentration and other difficulties with thinking and perception. People come to our practice referred by their psychotherapists, primary care physicians, specialty physicians, family members and by word of mouth. We approach patient care in a comprehensive and collaborative manner. Initial assessment includes an extensive review of history with the patient, mental status examination and sometimes laboratory testing. Input from family members and significant others and clinical review with a treating therapist and other physicians helps with our diagnostic evaluation. Treatment is approached as a partnership with our patients in which good communication and responsiveness to their needs is taken seriously. This partnership is critical in achieving the best clinical outcomes. Symptomatic relief is an initial priority and is often followed by improved occupational and social functioning. Ultimately, we are committed to helping our patients feel better and experience an improved quality of life. We strive towards making sure your visit with us is pleasant and efficient. To schedule an appointment or for any questions, you may reach our Westfield office at (908) 232-6566 or our Upper Montclair office at (973) 746-3333. © 2012 Moreines & Goldman, P.C. All Rights Reserved.